Just hooked up a DisplayTech 64128G (same display as used on the DB101, except this one has no RGB backlight, just white). It has annoying vertical stripes of reduced 'brightness' when viewed from the side; it's ok when looked at straight on. Seems some kind of capacitive crosstalk/regulation/too weak drivers problem areas that are bigger than a single pixel. Definitely not a defective glass, the annoying columns simply shift along when the picture is moved horizontally. I have seen the same phenomenon on a 64*128 pixels GLCD. The more expensive (and different brand) 128*128 doesn't suffer from this. Could either one of you provide me a link where I can purchase the screens? I have a big intrest in the RGB backlight. Displaytech is distributed by RS Components. Jim, my displays come from the guy who runs ledsee.com. But no RGB backlight on any of them. Sorry mate. 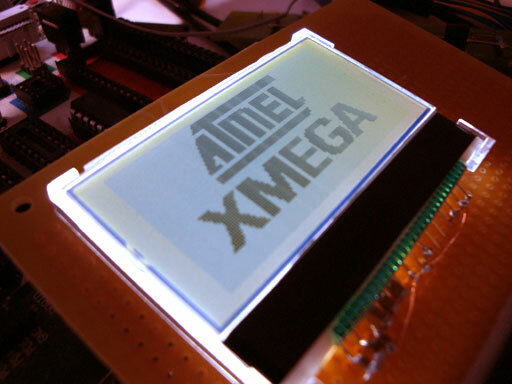 I have some 128X64 GLCD's with a backlight (Not the DisplayTech). I'd be happy to send you one if that would suffice. If interested, PM me with your shipping info. On the black stripes that is usually due to insufficient power decoupling, add more! I already tried that ;) And the display only consumes 12uA or so :? I used ceramic 1uF capacitors for both the voltage booster and the resistor divider network pins and they are soldered practically right onto the pins. I've used the Displaytech 64128E (not G) and had a similar effect; on my displays (RS supplied) the LCD is supplied soldered to a carrier with the bias voltages on-board and it just needs the processor to talk to the controller chip. It displays a similar effect and I think you're right; it looks as if the power supply for the bias generator can't quite hack it. The contrast of the image can improve it a little, I find, and the addition of a large cap on the power supply to the board may be helpful. We no longer offer the S64128G used on the AVR board due to the Samsung S6B1713 driver IC going obsolete in October. The new part number is S64128K and the parts can be found at www.displaytech-us.com under the RGB section. This new K part is a mechanical fdrop in replacement. Also, all Displaytech RGB parts (9 in total) are available through Mouser. Thanks Mike; the G a lovely display - is the K software compatible? It looks to be using a family member controller chip. As a request from an often-frustrated user - it would be *very* much appreciated if displays had available demonstration code, particularly to initialise them. It's not often clear - particularly for devices with software contrast control - where useful settings are to start. The driver chip docs can tell you *how* to do, but rarely tell you *what* to do.